I found this newspaper article in the vertical file. 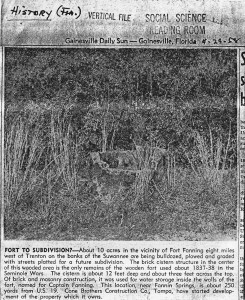 Remains of Fort Fanning were visible in 1958, and were bulldozed to build the subdivision. The article shows that they knew what it was. Such a shame, because this would have been one of the best archaeological sites of Seminole War forts. But, the cisterns might still be under the ground. The photo is hard to see, but it shows a brick well or cistern surround by grass. The Gainesville Daily Sun--Gainesville, Florida, April 29, 1958. This location, near Fanning Springs, is about 250 yards from U.S. 19. Cone brothers Construction Co, Tampa, have started development of the property which it owns.